As a serious nail polish addict, I've really been looking forward to doing this gift guide. 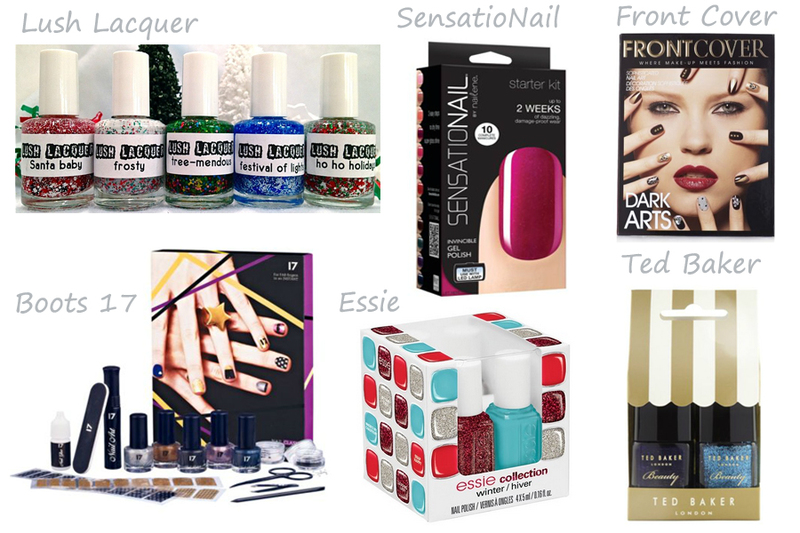 Christmas means sparkles, so nail polish at Christmas time goes just a little crazy, and unintentionally, nearly all of my picks for this gift guide include some form of glitter polish! I love a good nail polish set, it always seems a more justifiable purchase when you saved money because you bought in bulk doesn't it? The ncLA trio is a serious glitter fest ad I particularly like the pink and purple glitter - I'd totally wear them together (I reviewed some ncLA here). I know Santa has the China Glaze minis in his sack for me and I can't wait to get my hands on them. I haven't picked up the Ciaté sequin manicure kit yet, but I wouldn't mind getting one for Christmas. I loved my Nails Inc Bling it on Rocks set which I showed you here and Bling it on hologram is the same idea in another beautiful colour. The OPI is a cheat as it's clearly not a gift set, but The Living Daylights polish is this year's Rainbow Connection and needs to be in every Christmas stocking! And finally in this section I have my eye on this gorgeous sets by Butter London - I've not tried one of their polishes yet, and this set looks like a good place to start. If you love glitter polishes and are ready to take it to the next level of awesome, you need to be checking out an Etsy store called Lush Lacquer. They make their own glitter mix polishes (an art known as 'franken' in the polish world) and they're just ten steps ahead of anything we can find in the shops. I may have a placed a massive order with them, so look out for some swatches soon. 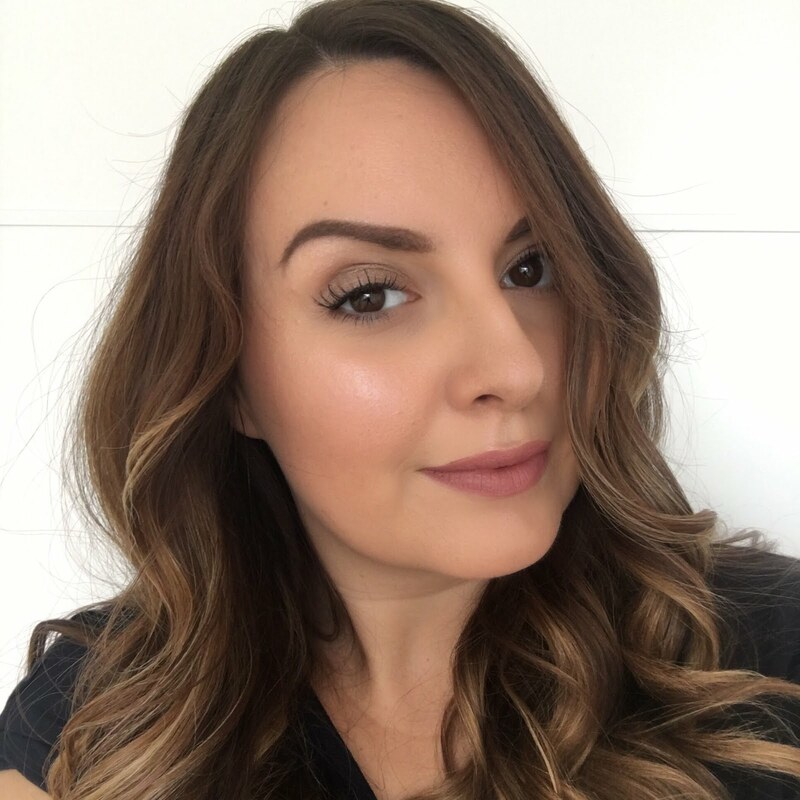 The SensatioNail kit intrigues me - I'm a bit of a perfectionist when it comes to nail painting, so I think I'd be pretty nifty with this gel polish business. Front Cover and Boots 17 both have two nail art kits for us this Christmas and I'm struggling to choose between the two - either under my tree will make me happy. Essie's winter minis are another fab gift for anyone who loves nail polish, and it's a pretty bold mix for a Christmas collection, popping a turquoise in there is rather unexpected, but I like it. And finally, a gift that several people will receive from me this Christmas because they're just perfect for the price and so cutely packaged is the Ted Baker Nail duos - these come in a choice of three different colours and each set has one glitter and one creme polish. Phew that was a lot of nail polish - it's sort of given me the urge to go an re-paint my nails with ALL the glitters! 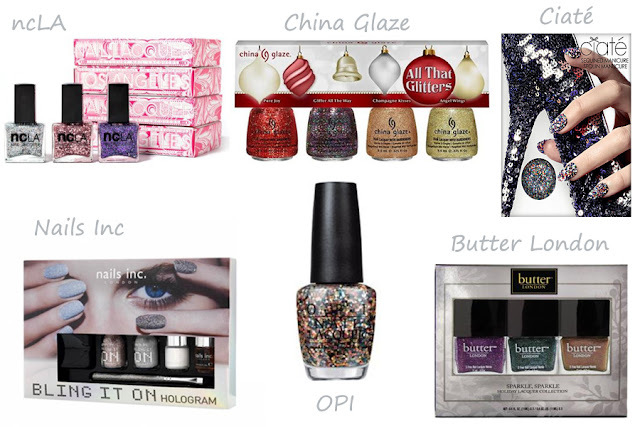 Will your stocking be overloaded with nail polish this Christmas too? Thanks! The Essie one is so popular, I had trouble finding somewhere to link to that was in stock! I really wanna try the Butter London polishes! Me too, they look lovely. Ooh I've got my eye on the China Glaze, Butter London, and Essie sets!